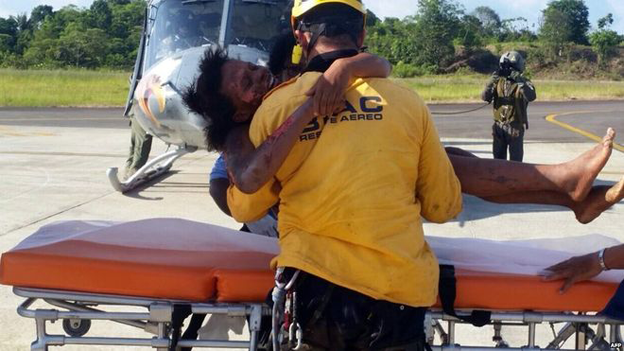 A young mother and her baby have been found alive five days after their plane crashed in the jungle of western Colombia. 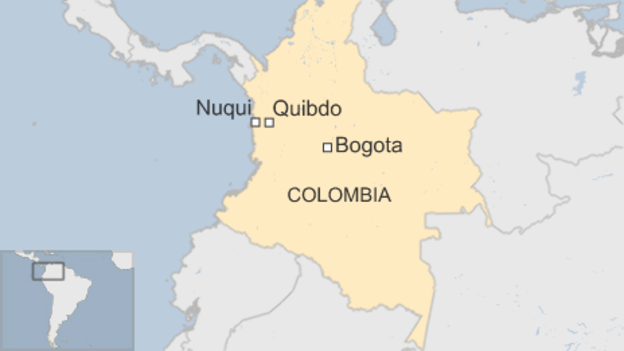 A Colombian Air Force chief described their survival as "a miracle". Maria Nelly Murillo, 18, and her one-year-old son were found by rescuers near to where their small Cessna plane crashed in Choco province. Ms Murillo had some injuries and burns while her baby appeared to be in good health. 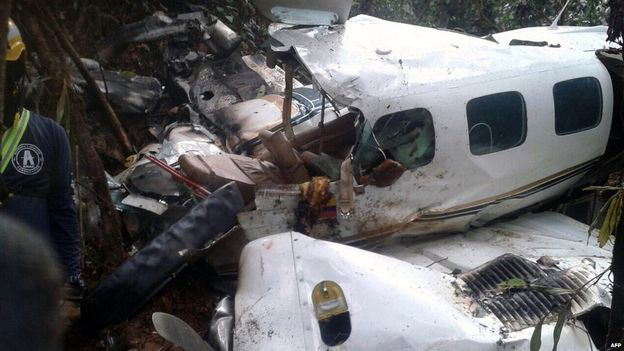 The twin-engine Cessna plane, which was carrying fish and coconuts, had been flying from the town of Nuqui on the Pacific coast to Quibdo, the capital of Choco. 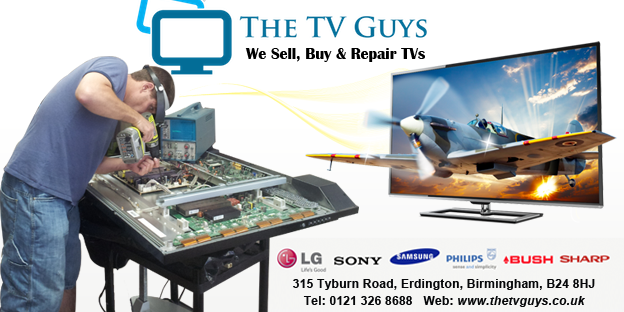 It disappeared from the radar of the civil aviation authorities 20 minutes into the flight. When the pilot did not respond to any calls, officials knew something was wrong and despatched a plane to search the area. It took the search team two days until they finally spotted a white dot in the dense jungle, which turned out to be the remains of the Cessna. It had crashed, for reasons not yet known, in the Alto Baudo region. When the search team reached the Cessna, they found its pilot, Carlos Mario Ceballos, dead in the cockpit. There was no trace of Ms Murillo or her baby, Yudier Moreno, which the passenger list said had been on board. But according to Col Hector Carrascal of the Colombian Air Force, rescuers took hope when they noticed that the cabin door was ajar. "It could have opened on impact, but it could have been opened from the inside," he said. "But that's when we started to worry. We didn't have a clue what had happened to them: they could be lost in the jungle trying to survive or they could have died already." 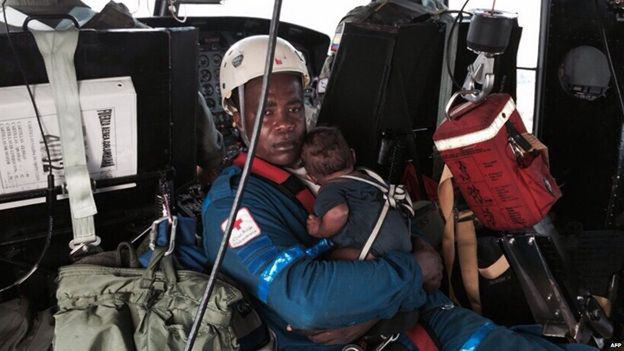 But then the rescuers found clues which led them to believe Ms Murillo and her baby could still be alive. Coconut shells near the plane and a discarded flip flop in the jungle lifted their hopes. They also found the baby's birth certificate near a tree, which convinced them that Ms Murillo was trying to leave a trace of her path through the jungle. Part of the search party scoured the jungle on foot while others flew over the area in a helicopter using a loudspeaker to shout Ms Murillo's name and urge her to return to the crash site. But for two days their search yielded no results. Finally, on Wednesday, they located Ms Murillo about 500m from the site of the crash in a ravine on the banks of a river. "It's a miracle. It is a very wild area and it was a catastrophic accident," Col Carrascal said. Of the baby, he said: "His mother's spirit must have given him strength to survive." 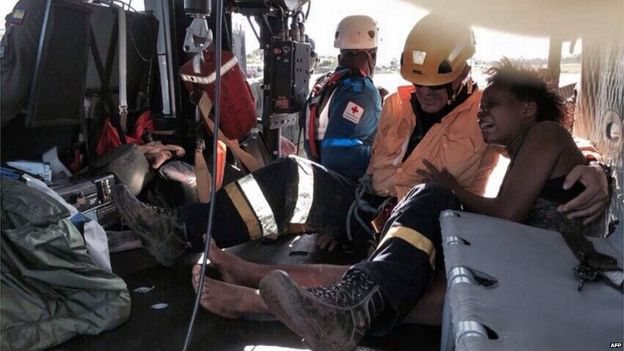 The couple were airlifted to a hospital in Quibdo. Ms Murillo told medical staff that she had managed to open the cabin door and run into the jungle as fire was spreading in the cabin. She then reportedly went back for her baby, at which time she sustained burns to her face, an arm and a leg. Afraid the plane might explode, she walked into the jungle along the bank of a small river. Details of how she survived are still sketchy, but local media said she came across a couple of indigenous people who helped her. She was also able to drink coconut water from the coconuts the plane had been carrying, local media said. She reportedly heard the calls over loudspeaker from the rescue helicopter which prompted her to make her way back to the crash site. She is being treated for her injuries in hospital. Her baby son is said to be unharmed.